Iota Localization Services - Where does pseudo-translation fit in to the localization process? When it comes to software localization it’s difficult to predict the impact of introducing a new translation without careful planning, testing, and QA at every stage. Iota use a number of tools and techniques to manage risk throughout the localization process, an important one being pseudo-translation. 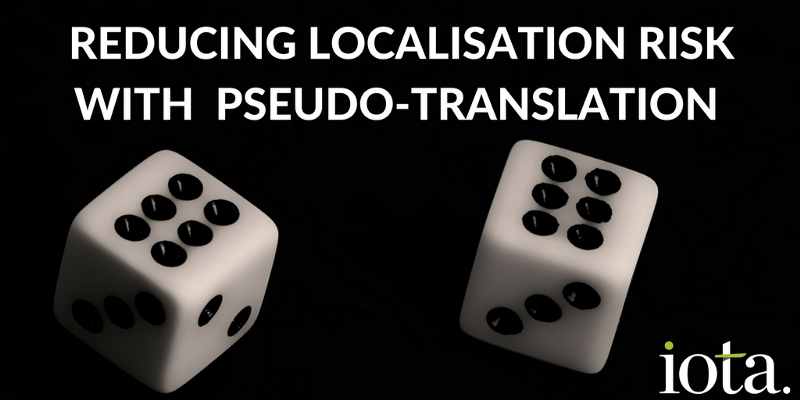 We use pseudo-translation frequently when customers localize new applications, or if major changes are made to an existing module or component of an application. It is very useful in highlighting internationalization issues such as hard-coded strings, string size limitations, character display issues and functionality issues caused by over-translation. Pseudo-translation is the process of mimicking the translation of resources and populating the strings with test characters. The resources can then be re-integrated into the application in the same manner as a proper translation, and then the application can be checked for internationalization issues. The benefit of pseudo-translation is that it can be done quickly, rather than waiting for a ‘full’ language translation of the resources and only then seeing potential issues. The tools we use allow us to specify the anticipated amount of string length growth, so we can pseudo-translate strings to a certain percentage longer than the source and check for sizing issues. We can use characters typical of the languages we are planning to translate into, using language dictionaries if required. This means we can see how the application handles double-byte, Cyrillic,and bidirectional text if those languages are target languages for the application. Iota engineers can work with you to define a pseudo-translation plan to prepare your application for localization. A little time spent up front doing this work can save a lot of time if issues are discovered further down the line with release dates looming.